Daily Illuminator: Play In The Day Of Wreckoning, Share, And Win! April 2, 2018: Play In The Day Of Wreckoning, Share, And Win! There's a reckoning coming for the Munchkin Collectible Card Game . 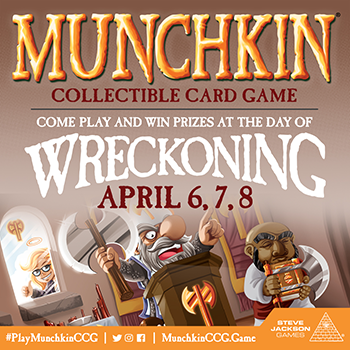 . . the Day of Wreckoning, happening at game stores around North America this coming weekend, April 6-8! Participating friendly local game stores will have tons of awesome prizes, like oversized, alternate art Hero cards, and a coveted poker chip Run Away marker! But why keep all that fun a secret? Share pics from your local event on Twitter, Facebook, or Instagram with the hashtag #PlayMunchkinCCG, and you'll be entered to win even more loot. We'll pick one winner per channel, and the winners will each receive a full set of Organized Play Kit 1 promos, signed by one of the designers, Eric M. Lang! The contest will run until 11:59 p.m. (CDT) Tuesday, April 10, to give players a chance to share their pictures. Make sure to check out your local events on our previous blog post, and contact your store for the exact date and time of the event. Some events won't be happening this weekend, but will still have awesome prizes!